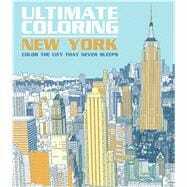 The Big Apple is bursting with promise in Ultimate Coloring: New York. Illustrations of notable structures and landmarks such as the Empire State Building, Central Park, the Brooklyn Bridge, and the Statue of Liberty are presented in vivid detail on oversize perforated pages so that the completed masterpieces can be displayed on your wall. Each of the 47 illustrations is accompanied by descriptive text and trivia, so you can imagine yourself being in the City that Never Sleeps while you color in the scene. Thunder Bay Press is an imprint of Printers Row Publishing Group, a division of Readerlink Distribution Services, LLC. Thunder Bay publishes across a wide and varied range of formats and categories, from fun, interactive activity titles and kits on subjects such as origami, cooking, crafts, games, and art to reference books suitable for gift-giving in categories like art, fitness, pets, travel, history, culture, sports, and nature. Thunder Bay Press celebrates the book in all its forms, and publishes something for everyone.